Whether you are looking for a professional contractor, a new career or skilled manpower the IBEW is the Right Choice! Event details and hotel information can be found here. This month's newsletter can now be found here; April 2019. To view any past newsletters please visit our newsletter tab on the Members Only page for archived issues. If you would like to get signed up for access contact Jeremy at the Hall for login information. Santa came to visit on December 8th and a great time was had by all. Thank you to those that came and partook in the festivities. Local 158 Helping to give back. 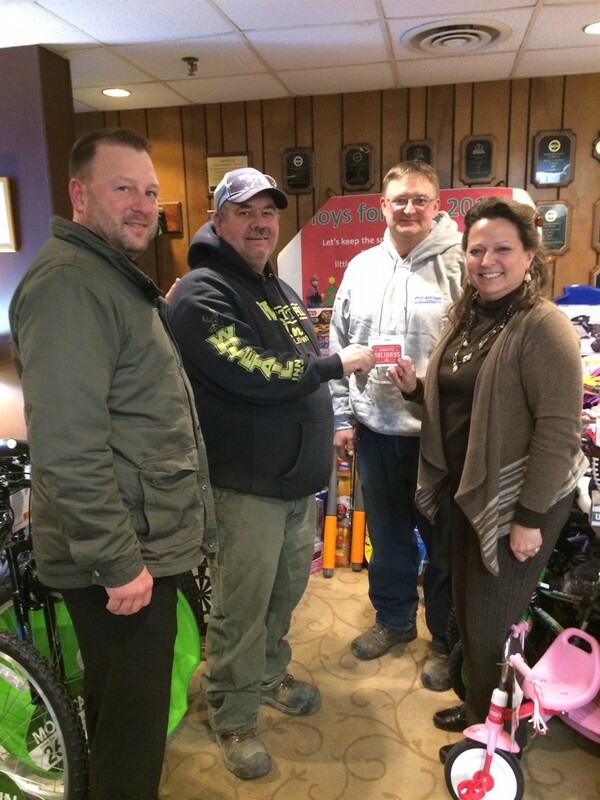 Local 158 members helped again this year with Bayship Building's Annual Toys' for Kids drive. Pictured from left to right: Local Agent Jesse Jacques, Local members Randy Conard(Cooney) and Eric Svacina, and Bayship employee Julie Koch. First Aid/CPR/AED: The State of Wisconsin Bureau of Apprenticeship Standards is not accepting First Aid/CPR renewal if done through an online course. The option can be found under dues payment in the members only section. If you are trying to access the members only section of the website please remember that the web referral and the members only section are different logins. If you have not signed up yet for the members only section please contact your hall to get signed up. Text message and e-mail alerts. The text alert service will be used to provide reminders on upcoming classes, meetings, and other important messages from the office i.e. death of members. Click here for sign up instructions. E-mail alerts will be used to notify people when the newsletter is posted online. Click here to sign up and include the user name and password you would like used for your log in under comments. 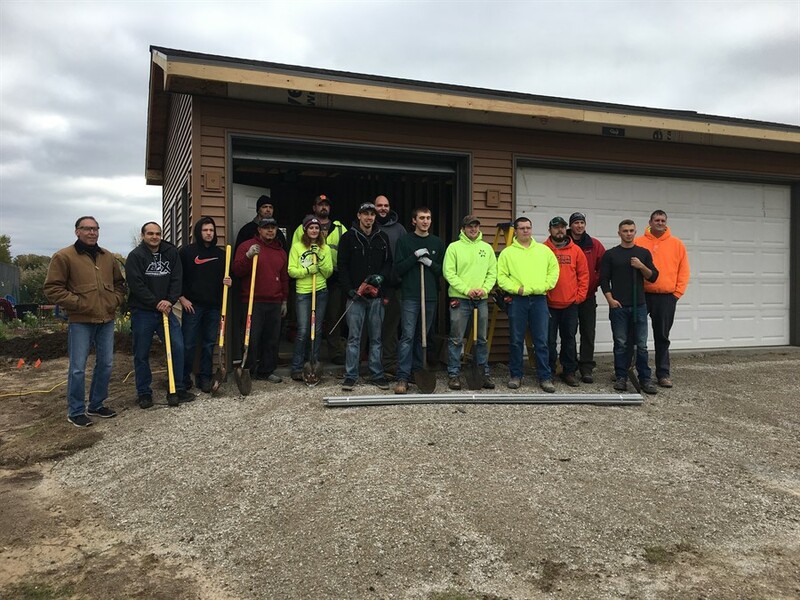 IBEW Local 158 apprentices helped out recently at Brown County Shelter Care. They trenched and installed the electrical work for the new garage that was built to store the residents belongings. Great job to all those who helped make a difference today for people in need. In speaking with DSPS the CEU window for getting your credits now coresponds to your license. This means that you now have until your credential expiration date to get your CEU's. If you are in need of CEU's we have take home books in addition to the list of upcoming classes. Local Journeyman is Mentor of the Year. Congratulations to our own Marsha Nebel as the 2013 IBEW Hour Power Journeyman Mentor of the Year. IBEW Local 158 and Solar Generation. You are now able to view your Sub account, Flex account and check your dollar bank balance and eligibility status under the Health and Welfare Benefit Fund on this web page. If you have any questions please contact the Wisconsin Electrical Employees Benefit Fund office at 1-800-422-2128. IBEW, proud half carat sponsor of the 65th annual CP Telethon! 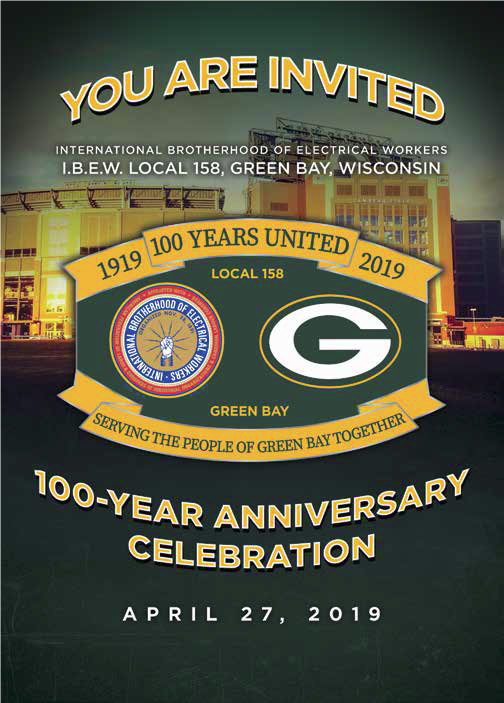 IBEW Local 158 has been a long time friend of CP, Inc. whether it involves putting a team together for the CP Bowl, installing PV panels to reduce the bills, or by being a part of the community and sponsoring the CP Telethon. 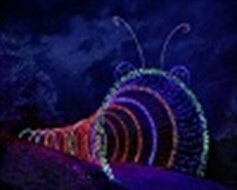 WPS Garden of Lights features nearly a quarter of a million twinkling lights. Green Bay Botanical Garden dazzles thousands of visitors throughout the holiday season as it's transformed into a stunning winter landscape featuring botanical light displays inspired by its natural features. Find out more about our wages and benefits here.